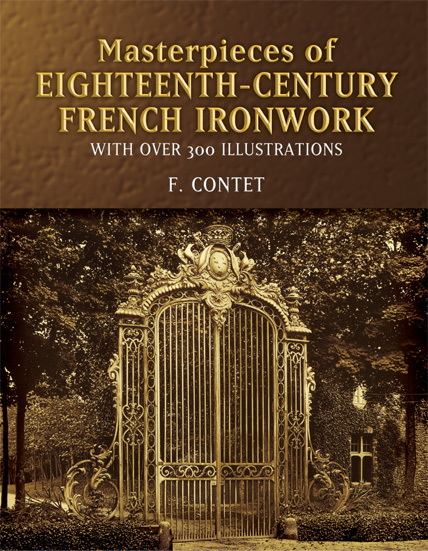 This magnificent display of all 166 plates from an extremely rare set of portfolios depicts scores of examples of the ironworker's art, among them beautiful gates, balustrades, balcony railings, window grilles, church screens, and lantern holders. A superb collection of royalty-free images for use by designers, architecture enthusiasts, and lovers of antiques. Unabridged reprint of Documents de Ferronnerie Ancienne de la Seconde Moitie du XVI-II Siecle, Series 1-4. Originally published by F. Contet, Paris, 1908-12.